I usually make my panna cotta with all cream, or possibly with a little bit of milk. However, that can be pretty rich, and sometimes it's nice to have a fresher sort of dessert. This one works well! Start by soaking the gelatine sheets in cold water. Meanwhile, heat the milk, cream and sugar in a small saucepan. Scrape out the innards of the vanilla bean and add those to the pot. Bring to a boil. Remove from heat and stir in the white chocolate. When it's all melted, add in the now softened gelatine and stir well. Finally stir in the yogurt. Pour into five glasses or cups, and place in the fridge to set for at least four hours. 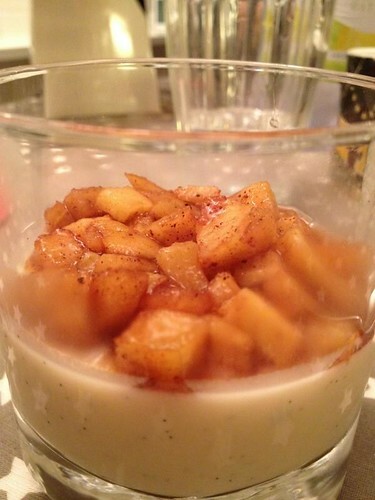 Top with whatever you fancy - since it's fall, I did a quick apple compote topping by heating some diced apples with a little sugar, lemon and cinnamon. Hello! Would you like to share your recipes on http://whenangelscook.com? Check it out :) already great presence on FB, twitter and Pinterest - http://pinterest.com/gabrielle8008/when-angels-cook/ - would love to see your recipes :) - it is new and will grow because of you! Oh my this looks amazing! Great spring feeling and so yummy! Just something for me, the fresh taste... nam. An acquantance for the future.